AMP Energy (or simply AMP) is an energy drink brand produced and owned by PepsiCo. At the time of its introduction in 2001, AMP Energy was initially distributed under the Mountain Dew soft drink brand. Since 2009, it has been produced and labeled under its own stand-alone trademark name. The beverage is packaged in both 16-ounce and 24-ounce cans, and is sold in the United States and Canada. As of 2009, AMP Energy was the number four energy drink brand in the U.S. in terms of overall retail sales. The original formulation of AMP Energy was positioned as a flavor extension of the Mountain Dew brand, and in 2001 its label read "Amp Energy Drink from Mountain Dew." 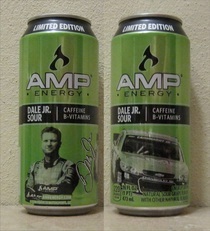 In 2008 the label design was changed to contract the product name to a more concise "AMP Energy", with the Mountain Dew logo being shifted to the lower portion of the cans. According to beverage industry commentators at the time, this labeling update was enacted with the intent of "placing a stronger emphasis on the 'Amp Energy' brand and less on its Mountain Dew roots". The AMP Energy product line has since expanded to a broader range of flavors and variants, which as of 2010 included AMP Energy (Original), Sugar Free, Overdrive, Relaunch, Elevate, Traction, Green Tea, Lightning, and Sugar Free Lightning.